FTP stands for File Transfer Protocol , a standard used to transfer files over internet and related services . It might be very difficult for a newbie to understand the use and architecture FTP in web hosting and allied services . Here we will make it simpler though a working example and a commonly used Windows FTP client CoreFTP . Check out how you can upload website files to a server using CoreFTP . But if you are uploading large blog softwares like WordPress (contains around 1500 files ) ,you would need an FTP software like CoreFTP . It can use File transfer Protocol to connect to the required port and automatically send files to the required directory in file manger from Windows desktop . 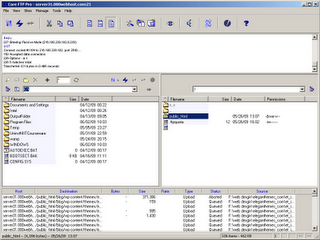 We can edit ,delete and modify file manger without accessing host CP through browser. Here I am uploading WordPress to techknowl.com using CoreFTP. Open CoreFTP and create a new profile . For filling the details ,you need to collect FTP user name , password and server name from your host’s FTP menu . Here I am using FTP details of my 000webhost free hosting account . Fill the above mentioned entries as shown below and keep others exactly the same . Now click on connect . If the server details are correct , CoreFTP will open your root FTP folder on the blank right pane . Open public_html . Your file are to be uploaded here . Now open required website files from left pane and drag it to bottom pane . Select all and right click to process queue . Now all files selected from Windows desktop will be uploaded to the public_html directory through FTP . You may further edit ,delete or modify them from right pane . Index.html/index.php/index.asp page in public_html directory will serve as your website homepage . Update : 000webhost is real scam webhosting company . They deleted few of my websites without any warning . So if your website and files are anything important ,then use reliable webhosting companies like Hostgator and Dreamhost . Both Hostgator and Dreamhost provides promo codes and discount coupons so that you can start webhosting at lower cost .